Sambaram: Sambaram is a buttermilk beverage native to Kerala, a state in south western India. Sambaram is traditionally served to guests. It is also served as part of the Kerala Sadya. 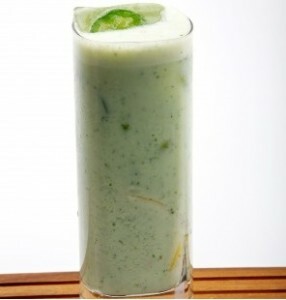 Salty, tangy and spicy, the light-green drink aids in digestion as well. 1 small jalapeño, seeded and coarsely chopped. Place a thin slice of jalapeño inside each well of several ice cube trays. Fill the ice tray with water. Freeze until solid ice cubes are formed. Working in three batches, combine approximate thirds of the buttermilk, chopped jalapeño, cilantro leaves, curry leaves, ginger, lemon juice and salt in a blender. Transfer the buttermilk mixture to a large pitcher. Chill in the refrigerator, while you puree the remaining batches. Fill tall glasses halfway with the jalapeño ice cubes. Divide the buttermilk mixture among the glasses. You can strain the mixture through a fine-mesh strainer, if you like. Top with a spoonful of foam (from blending) on top. Garnish the glasses with a lemon slice and finely chopped cilantro. If you have any queries about this Sambaram Recipe , please write down in comment box below.